I emailed a similar message, but thought I'd repeat the post here, as it may be useful to others, if this gets resolved. I only hear white noise coming from the output. With no external cables attached, I connect my scope to the inputs. Attached pictures show what I see with the scope at the inputs and outputs. Measured at the output with 50% gain. Frequency increases with gain. I forgot to ground the PCB to the panel components. 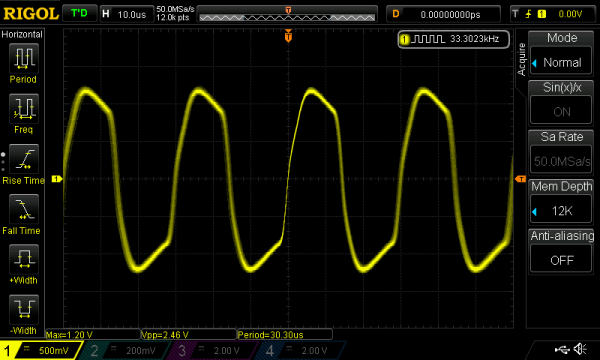 I would like to say that there is one small issue... the lowpass band bleeds into the output. I built the individual band level controls, and the only way to get around it is to shut that band off completely. But it would be nice to have it working properly. Any ideas how to prevent this bleed through? signal bleedthrough can be caused by capacitive coupling of cables, make sure you have some power supply filter caps aswell, you could even calculate them to cancel out the kind of frequencies you are working with. Shielding is the usual solution for blocking out outside/unwanted signals. It's just the lopass which has the bleed. All other bands work as expected. hnmmm weird... I'd have to get a look inside to really tell you more, you seem to have done everything well. By capacitive coupling I didn't mean anything to do with the capacitors- it's really that unintentional capacitors are created by close together cables, allowing the passage of AC signals between cables, but if shielded, as you have done, that problem should be prevented. Does the lowpass section have any traces that have long(ish) parallel runs next to the output traces? That's the most common way for coupling to happen. The rev 1 TTSH's had that problem with VCOs 2 & 3, had to cut a trace and run the signal a different way with a shielded cable. What's interesting is the problem is only evident when the modulation source (mic input) is set to 'mic', when switched to 'line', it works as intended (no bleed). That's not surprising: a mic level signal needs more amplification, which means it's more likely to pick up low-level bleed. I'd understand that, but the bleed comes from the carrier (synth). 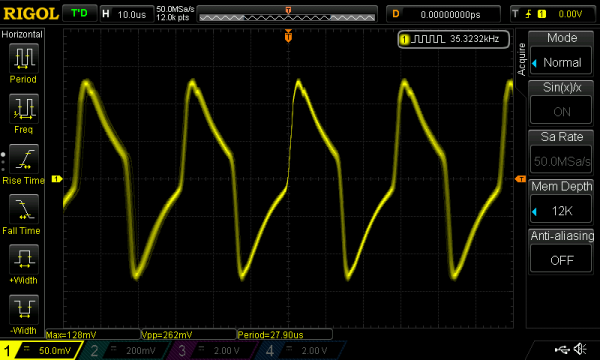 It is still present when the modulator is turned fully anticlockwise, so the signal is ground zero. When I switch the modulator to line and turn the dial to maximum, no bleed. The bleed only comes from the hipass and lopass bands (I did the individual band mod, so it was easy to determine). It's exactly the same as in mine. As far as I can tell, the problem sits in the onboard mic preamp. I have constant 260 mV on pin 1 of IC1 resulting in about 1.4 V on pin 7 of that IC when the audio toggle switch is set to 'mic', no matter how I set any of the pots. I double checked all the component values in that section but couldn't find any mistake on my side. That's exactly what I do as well .